What does becoming an architect involve and who is the position suited to? 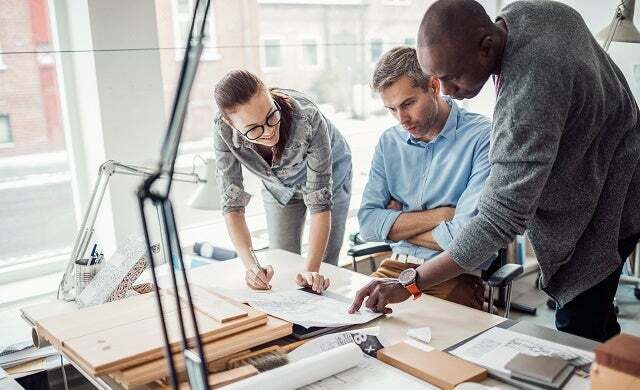 It’s said that every man (or woman) is the architect of their own fortune, so if you have a strong penchant for design, drawing and innovation then owning your own architecture firm could help you build an esteemed career. An architect’s main role is to plan, design and oversee building projects for clients from start to finish. As you’ll be required to use maths, design software, and be able to physically sketch and draw plans and designs, architecture is generally suited to someone with a methodical, logical approach to working and someone who possesses great analytical and communication skills. While the average architect will generally work between 35-40 hours a week Monday to Friday, the industry is incredibly competitive and has become synonymous with later working hours in recent years. Day-to-day tasks vary from creating detailed technical plans, ensuring projects follow building laws and safety regulations, managing budgets, choosing materials and checking building work and progress. “The architect stereotype is an introverted perfectionist, however it is a profession that has scope for a lot of different personalities. Most important is [that you have] an attention to detail and a true passion for the subject. “It is said that an engineer knows a lot about one thing and an architect knows something about everything. I suppose it is the jack of all trades really, and it needs to be in order to coordinate information from the other, more specific professions. Combining art, science, mathematics and tech with office work and trips to buildings sites and projects, the route to become an architect is one of intense study and lots of continuous learning, so those allergic to education should best stay away. If, however, you relish the opportunity to constantly learn new things then becoming an architect should be an attractive option. Earnings: How well do architects get paid? While you’ll no doubt spend a lot of time and money becoming an architect, once qualified you can generally expect to earn a very decent living – though your salary will vary considerably depending on your position, specialism, what contracts you manage to secure, and where you operate in the UK. According to the UK Architecture Salary Guide, the average salary for a director of an architect firm is currently £85,000 annually – with the lowest-paid earning £60,000, while the highest stands at £120,000. Associate directors or project directors are generally paid £65,000 a year but can earn up to £85,000 and can expect a salary of at least £55,000. “Architects earn a very disproportionate amount of money to the hours they work. I always find it funny when you tell people you are an architect; they assume you are loaded. The road to becoming an architect is a long and arduous one and you’re required to complete several years of specialist higher education before you can legally bear the term ‘architect’. How long does it take to become an architect? “The title of architect, unlike engineer or consultant, is a protected title until you have obtained the eight years of education/or equivalent approved by the Architects Registration Board (ARB), says Innes Associates’ architectural assistant Bradley. Though the length of time you’ll have to spend in full-time education will vary around the world, the minimum amount of years you’re expected to complete in the UK is seven years. An important consideration for aspiring architects, the majority of these years will be unpaid so you’ll need to ensure you have a viable source of income while you study. Part-time courses are available if you wish to earn a salary, though will naturally prolong the process of becoming a fully qualified architect. If you don’t have the required school grades then some institutions may either judge your application on the back of your experience or your portfolio. If you’re an undergraduate student, entry requirements from architect courses vary and there is a growing emphasis on a good portfolio and practical experience. Generally, however, most universities will require five GCSEs (A*-C) which will include English, science and maths, and at least three A-Levels, or equivalent, in any subject (although subjects such as art and maths are preferable.) Most architect courses will also ask to see a portfolio of creative work, and may invite prospective students to an interview. Stage one: The first stage of becoming an architect involves undertaking an undergraduate degree, and your course MUST be validated from the Royal Institute of British Architects (RIBA). Normally lasting between three and four years, modules are intended to provide you with the basic skills of drawing and CAD (computer aided design) drawing, as well as theoretical, historical, material and technical issues. Validated courses usually include the RIBA Part I examinations that all architects require. After you have completed your undergraduate degree, you’ll be required to complete some practical work experience – which normally lasts 12 months before you can progress to the next stage. During this time, you’ll be required to record your work which is then monitored by a Professional Studies Advisor (PSA) from the university you attended, and your employer. Stage two: Once you’ve finished your one year work experience, you’ll need to return to university and complete a two-year postgraduate degree such as a BArch, a Diploma or a March. It’s worth noting that the modules offered by each university will vary considerably, with different levels of emphasis placed on different areas of architecture. So, if you’re looking to get into a specific area e.g. landscape, residential or green, you should put some important consideration into which course you enrol in. Stage three: Once you have obtained your post graduate degree, you’ll need to complete another 12 months of work experience before moving onto the final exam – the Advanced Diploma in Professional Practice in Architecture (ADPPA). Running over three days, the ADPPA requires you to complete an open book office-based exam and submit your CV, self-evaluation, case study, PEDR log sheets and exam answers. Only once you pass the ADPPA can you legally bear the term architect. “I would recommend not being governed by assumed parameters of ‘what an architect is’. I think studying at an art school loosens the constraints and allows free-er thinking. One can always learn the boring building regulation stuff as soon as you enter the working world. How much does it cost to become an architect? The cost of setting up your own architectural firm can vary immensely depending on how big you want your practice to be, and what type of clients and contracts you hope to attract. Modern architecture has become quite expensive with programmes costing up to £2,000 a year in some circumstances. Alternatively, a £200 piece of architect software will give you the capabilities to work as a sole practitioner in a spare room of your home without any issues whatsoever. Therefore, the start-up costs can be much more reasonable. It is still possible to work on a drawing board with nothing more than a pen and paper; however this is a much more laborious process and certainly makes the £200 software more appealing. “The start-up costs can be very low. All you need is a desk, a computer, the required software, a printer and off you go! They call it the ‘kitchen table architect’ and it’s only once you grow that the associated costs start to come in.” says ArchitecturAll’s Skeffington. Naturally, you’ll need to consider the costs of renting an office if you want to be bigger than just a one-man band. Consideration must also be given to other annual costs. A rule of thumbs is that a medium-size practice will spend roughly equal amounts on salaries and other costs. What should you include in an architect business plan? Once you’ve qualified as an architect (see below), you’ll need to draw up a business plan and decide what type of work you’ll primarily focus on and what market your architect business will target. Residential architect: As a residential architect, most of your clients will be private homeowners who will entrust you to help them design and build their home. Think Grand Designs! A knowledge of local regulations will be key, and you’ll need to ensure that you have local neighbours on side. Commercial architect: Sometimes referred to as a public architect, the majority of your contracts will be provided by the government and other state bodies to build schools, libraries, government buildings or even shopping centres. Industrial architect: While generally more suited to engineers, architects can sometimes be commissioned to design major industrial projects like hydroelectric dams or bridges. Landscape architect: Looking to earn both private and government contracts? Landscape architects focus on outdoor areas and will often specialise in recreational spots such as golf courses or college campuses. Green architect: What you’d expect given the name, green architects build environment-friendly structures and often incorporate solar panels into their works or design passive houses. “It’s necessary to have a clear idea about what your identity is. It is all too easy to select a style or building typology that you appreciate, however, it is more important that you find a process that you connect with and a moral integrity which you aspire toward. The job typology is therefore not as important as the office’s ambitions. Once you’ve decided what area you’ll specialise your architect business in, you should decide what size firm you’re looking to create and what your growth plans are. Remember, taking on too big a project with a small team will not only infuriate your client and damage your reputation but will also increase the likelihood that you will fall foul of regulations and health and safety. Bradley continues: “An architecture practice can be anything from a sole practitioner working in their home, to a multinational company of over 1,000 staff in several continents. There are positives and negatives within both.